November is a month to be thankful, and at Simplefill Prescription Assistance Programs, we’re showing gratitude for our nation’s pharmacy workers. Celebrate National Pharmacist Month with us and explore more about the history of this vital industry. The roots of the pharmaceutical profession stretch back to the Sumer people, who lived in present-day Iraq. However, it wasn’t until the 17th century that the first pharmaceutical guild launched in Britain. The practice of medicine was, much like it is today, a highly specialized field and patients relied on local pharmacies for treatment and guidance. Yet the medical industry lacked standardization. Apothecaries administered homemade remedies that could differ vastly depending on the creator. To develop uniform medications for all patients, the British government passed the Apothecaries Act of 1815. This trend expanded onto U.S. shores, and in 1852, the American Pharmacists Association (APA) was established to create profession-wide standards. This was the first time that chemists and druggists were designated as “pharmacists” and had to comply with regulations and laws. Until 1951, pharmacies both created and prescribed medicine for patients. The Durham-Humphrey Amendment required patients to obtain prescriptions from a doctor before they could get access to medication. Today, we rely on pharmacists to create the medicine that provide us with better health. As we reflect on the history of pharmacy, the team at Simplefill has a suggestion: Next time you see your pharmacist, thank him or her. Without them, we would not have access to the medications that we need to leave healthier, happier lives. 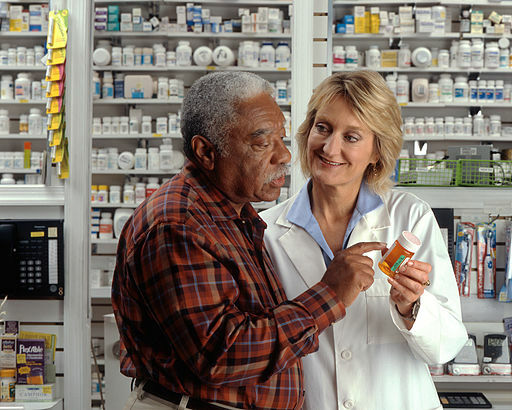 We are proud to work with pharmacists nationwide by providing prescription assistance for uninsured Americans. We believe every person should have access to the solutions pharmacies offer for our health. We do this through patient assistance programs for medications. If you need help paying for prescriptions, apply now. Image Courtesy of Rhoda Baer.